Childhood is a carefree time. However, for Goh Chun Hui, 28, his childhood memories were painful as he had to undergo gruelling blood transfusions at hospitals. When he was merely three years old, Chun Hui was diagnosed with Thalassemia major, a condition where his bone marrow is unable to produce normal red blood cells. While other three-year-olds were bustling with energy, he was often pale, lethargic and lacked appetite. “When I was seven, I had to undergo blood transfusions every two months. I had to go through desferal infusions when I was nine or 10 as iron accumulation may result in health complications. The doctors and nurses had to hold me down at the hospital as I was screaming in pain. It was a terrifying experience,” said Chun Hui. He recalled his father, who passed away a few years ago, bringing him to the hospital three to four times a week. His mum, who used to be a nurse, learnt how to infuse him in a hygienic manner from a government hospital. The desferal infusions carried on till he reached 18 or 19 years of age. “Every infusion took eight hours so I would often sleep with it, but because it was like a chain, it disrupted my sleep. At 16 or 17, I administered the injections myself. I was very nervous the first few times. Now, there is still a scar on my stomach,” explained Chun Hui, an administrator in the real estate sector. Chun Hui is very thankful for his encouraging and supportive family and understanding classmates and bosses. In his youth, Chun Hui was exempted from physical education in school as he was too weak to participate in sports. In his late teens, he was exempted from National Service. “I couldn’t engage in strenuous or adventurous activities like skateboarding or mountain-climbing. But I could still jog, swim, cycle, play badminton or table tennis,” he explained. 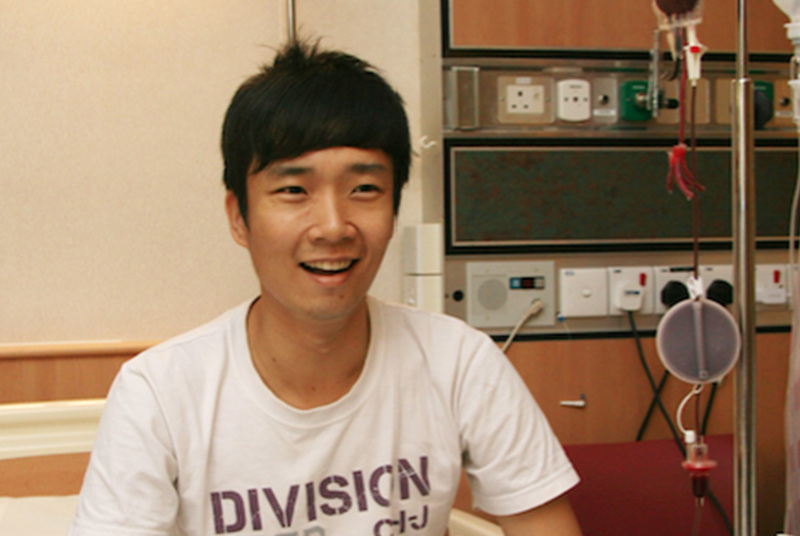 Chun Hui is grateful to blood donors for keeping him alive. Now, he goes for his blood transfusion once in three weeks. “I would like to thank blood donors for their time, effort and trouble to donate blood, to help me get through tough times. Without your blood donation, I won’t be here. Your blood runs through my veins. You are more than a lifesaver to me. A lifesaver saves a person’s life once. But you sustain my life on a regular basis and enable me to move forward,” said Chun Hui with heartfelt appreciation. You too, can be more than a lifesaver. You can sustain lives through regular blood donations, giving many like Chun Hui, the hope to move on.